Back in the eighties a directive was issued by television networks to Hollywood: "Get rid of any show with a tree in it." This exact statement came from an actor on the eighties television show "Greatest American Hero." Any television series with outside scenes had to go including Little House on the Prairie, Greatest American Hero and other shows with outdoor scenes. These shows were canceled without revealing why trees in outdoor scenes were no longer acceptable. Perhaps occasional chemtrails inadvertently filmed in the background sky in outdoor scenes was the reason. Ratings didn't make any difference to network dictators. The patriotic, creative, crazy and humorous Greatest American Hero was #1 in the ratings charts even in it's third year, and still it was canceled. Mind-numbing sit-coms replaced good fun and humor. Family dramas like Little House were now history. You probably have about as much love for sitcoms as I do. On television shows today, how often do you see the color green? Next time you stare at the silver screen look for the color green. Other than on nature documentaries, green is usually seen only in commercials which talk about removing grass stains. Rarely do actors wear green or will you find green on any television program. Why this is the case is unknown, even with today's green movement everywhere in society. I related the following story in an older essay but it bears repeating here. A brilliant retired scientist I know who worked for DuPont was in college back in the sixties. He earned his PhD in ecology. A movement to "save the planet" was beginning about that time. Only children born in the fifties or earlier are likely to remember the sixties era. Contrary to some opinions, the entire mother Earth thing started back at that time with the hippie generation, not by Al Gore of today or anyone else. When the ecological scientist worked at DuPont in the eighties he was worked in a totally unrelated area of technology ­ breakthrough trend monitoring of bearing failure of gas turbine generators which power DuPont chemical plants. I worked at a company which designed and manufactured instrumentation for his project. When I asked him in 1984 why he wasn't working in the ecology field, he replied: "When I was in college everyone was into ecology. By the time I graduated no one cared about the environment anymore." Will today's green movement also die a quiet death like the first movement? Not likely, considering that billions of dollars are created by the recycling industry. So what about this Green Cult? What is the definition of a cult? Most people tend to associate cults with particular religions. Cults are often strict and tell members what to do with little choice. However, these organizations can exist outside of religion. We find many striking parallels when comparing today's ecology movement to the above dictionary definition. The green movement has a religion-like veneration by it's followers. This obsession captures and brainwashes the minds of even the smartest people. This green cult has given us over-priced fuel-efficient cars among many things. In reality, these vehicles provide only marginally better mileage than a big vehicle made in the nineties. Everyone today raves whenever a vehicle gets 30MPG, as though this has never happened before. Before SUVs became popular 30MPG was not uncommon. Decent mileage isn't new, unless you're only about 10 years old and grew up in the SUV era. Case in point as I've mentioned in another article ­ I own a 1998 non-electric, non-hybrid Buick Park Ave. which actually gets 30 MPG or more on the highway. It travels about 460 miles on one tank of fuel. This Park Ave. does not have a puny 1.2L engine typical of hybrid vehicles, but has a big 3.8L engine with plenty of room inside. I drive 36 miles each way to work five days a week but fill it only once a week. And the best part ­ you don't feel beat up after being in the car almost an hour in the morning and another hour at night. A significant percentage of miles are city driving, too. Other facts clearly define the green movement as a cult. It has a body of adherents (rules) people are being forced to follow whether beneficial or economical or not. For example, the banning of filament-type light bulbs in Europe. In an article I wrote a few years ago, I compared today's energy efficient light bulbs to a simple filament light bulb. In an energy efficient CFL (Compact Fluorescent Lamp) virtually nothing is recyclable. It's made of numerous toxic compounds which cannot be melted and re-used again. Toxic white phosphor dust lines the lamp's glass tubing. Two milligrams of mercury are inside the tubing of every lamp. 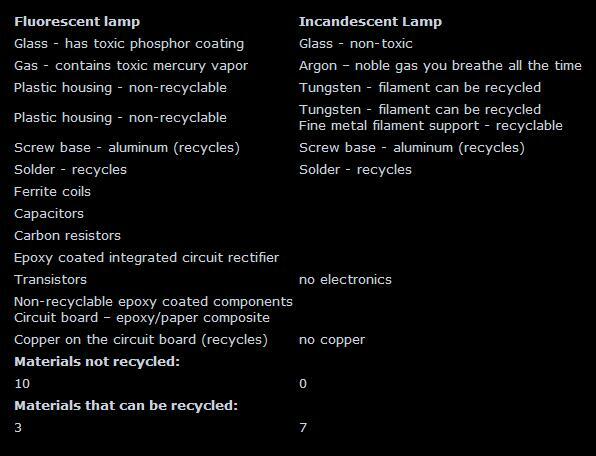 A circuit board often burns out, which requires discarding the entire lamp and buying another one (with more mercury.) No one has yet to find an efficient way to dispose of, or reuse these toxic materials. If you break an ordinary light bulb, you simply sweep and vacuum up the glass pieces and you're done.. According to the EPA, if you break a CFL you must follow hazardous material guidelines. Yet ordinary light bulbs are being banned everywhere, even though these are manufactured with 100% recyclable components. Is this a case of saving power today, and then using that saved power in the future to dispose of these toxic lamps? And there will be billlions of these lamps in the near future. Where will they all go? Into a landfill to contaminate soil and groundwater? Which would YOU rather buy now that you see the bigger picture? The green cult claims to have answers to everything about energy savings and environmental protection. Yet this same cult incrementally takes more and more decisions away from everyone, dictating more and more about what you will do and how you will live day and night. This cult is just another version of the frog in the pot. The green movement's body of adherents are simply rules. "Caution should be taken not to get the liquid crystal fluid in one's mouth or hands if a panel is broken. If this occurs, immediately wash with water." "Never swallow the fluid. The toxicity is low, but caution should be exercised at all times." The above statement is contradictory at best. Caution regarding what? Further, the EPA's website states that insufficient data is available from manufacturers on toxicity." Why won't the EPA test liquid crystal fluid themselves to get the answer? Considering the proliferation of LCD panels in recent years this should have been done a long time ago. What will happen when millions of these big LCD screens quit over time and become obsolete, ending up in landfills? Thrown into a landfill, broken glass panels will allow the liquid crystal fluid to seep into groundwater possibly poisoning forever. But no one appears to care about it right now. Not even a whimper about this issue from greenies who watch their Sunday sports or surf the web using LCD panels. This demonstrates yet again just how one-sided the green movement really is. Billions of dollars of revenue for numerous recycling industries depend on the green movement. Even cults or ecological movements always comes down to the almighty dollar. We clearly see green movement actions matching the definition of a cult by Merriam-Webster. A person, idea, object, movement or work is one of the dictionary's definition of a cult. Person? Al Gore's name and others are synonymous with the green movement. The idea? Saving energy, the Earth, the ecology and controlling what people buy and do. Objects? Light bulbs, vehicles, televisions, appliances and anything else than can be replaced. The obsessive idea of thinking green all the time day and night is inherent part of the movement. Movement? A growing mentality designed to permeate all of society and industry. There is just one requirement for anyone wanting to participate in the green movement: Get your wallet out and start paying for the privilege to boast about being green. Most likely anything you already own won't satisfy the latest green requirement for using it. Does not the green movement require the same monetary sacrifice religious cults require of their members? Sometimes property is used to make a payment to a cult, showing the required sacrifice has been made which proves brainwashing is complete. Perhaps it could be called the price of admission. Green supercars to dream about. (We know these vehicles don't exist and may never be allowed to be produced.) 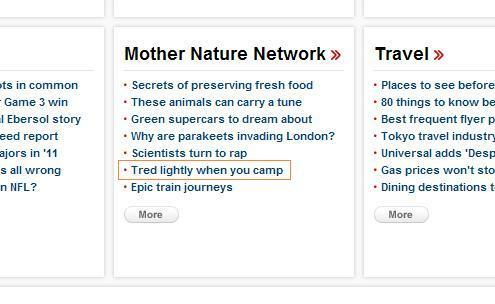 A story titled "Tred lightly when you camp" (outline added by author.) Most people go camping to relax, enjoy themselves and relieve stress. But greenies want everyone to worry, worry, worry. Imagine one of these people out in the wilderness, going camping after climbing a mountain: What am I doing wrong? Oh no - I breathed too hard climbing this mountain and created too much carbon dioxide! Did I just step on an ant or was that a termite? Did I just scare a bird away? If I drive my tent stake into the ground will it kill earth-worms below? On and on the guilt trip goes. Where it stops, no one knows. Defecating in the wilderness - there's a hot topic for greenies. Did I bring enough trash bags with me? What if I get the runs out here ­ can I pull a bag out in time and open it to catch my excrement? What happened in pre-toilet, pre-outhouse days wasn't all that long ago in human history. We all know what people did at the time to relieve themselves. Certainly when camping or hiking it's considered good practice to dig a hole and bury excrement. Or bury it afterward if there isn't time to dig the hole first if mother nature is screaming and not just calling. Nature will do the rest for you. But greenies today shake and tremble at such a thought, thinking that when they drop their pants or unzip their fly, they fear their waste might kill some poor helpless stinging or biting insect. Greenie people almost worship CFL light bulbs, and some of these fanatics have found their way into government positions to force their beliefs upon the population. But who will pay for dismantling these fluorescent lamps and recycling them? How many watts of energy and how much money will that require? No will ever care about this issue until a recycling fee is forced upon the buyer at the cash register. It's only a matter of time before this happens, and Europe will probably be the first to do it. Hybrid vehicles are another great example of green madness. It's dangerous to crush, puncture or burn any lithium battery. These batteries have been proven in laboratory testing to ignite and burn like a road flare, or violently explode. Lithium batteries must be hand disassembled to reuse lithium metals. Today there are countless different sizes and shapes of lithium batteries, and specialized robot machinery will be required to take apart each type of battery. It's only a matter of time before a car accident crushes or shorts out a high power lithium battery bank in a hybrid or all-electric vehicle. Imagine an all-electric car, packed with batteries from front to back and a fire suddenly starts - and you're inside. Is there any automotive history regarding failed protection of a critical automotive component? Everyone thought the Ford Pinto was the greatest thing since sliced bread - until it was found in the early seventies rear collisions at speeds as slow as 25MPH could rupture the gas tank and ignite it with deadly results. This happened in several accidents, killing six people. Now imagine potentially explosive batteries in an all-electric car packed in the back, just waiting for a rear-end or front-end collision. Tire balancing weights have been replaced with new non-lead tire weights. While these tiny lead weigh only a few ounces, there remains about 8.7Kg of lead and other heavy metals in every car battery. In any given vehicle there are gallons of toxic antifreeze, oil, grease, transmission fluid and power steering fluids, along with gasoline or diesel fuel. Greenie luminaries usually rant about non-green items we use everyday that must be replaced according to them ­ which will cost you and me money. Remember the great air-conditioning refrigerant replacement drive years ago when freon was banned? Freon was blamed for damaging the ozone layer without any real evidence. But the freon lie was never exposed for what it was ­ these same new refrigerants present in your home, business or vehicle also damage the ozone layer. It seems that no one bothered to inform the public about this minor detail, but I have discovered that many licensed and certified refrigeration technicians already knew about 20 years ago how the new refrigerant will still damage the ozone layer. People everywhere believed the mainstream fear mongers and rushed out to scrap their refrigerators, freezers, air conditioners, vehicles, etc... and buy the newest models. But the freon story doesn't end with just refrigerant replacement. Older piston-type compressors were used in refrigerators, freezers and air conditioners for more than fifty years. These were replaced with new simpler and more reliable scroll-type compressors right about this time. Usually an expensive compressor failing is what forces people to scrap refrigeration appliances. It should be acknowledged that scroll compressors have just one moving part which greatly improves appliance reliability, uses less energy and lengthens product lifetimes. Chemical companies certainly knew that a new generation of appliances would require more refrigerant and boost their business, too. Unless an appliance or vehicle develops a leak, refrigerant never wears out and never needs replacing. Demonizing freon was highly effective to increase sales, and drove up stock prices for both appliance manufacturers and chemical companies. In 1998, a big $300 million dollar communications satellite known as Galaxy 4 was crippled in orbit when the electronics malfunctioned. After engineers analyzed the data from the satellite's processors, the fault which disabled the satellite was traced to fine, whisker-like growth created by lead-free solder on a circuit board shorting out critical electrical signals. 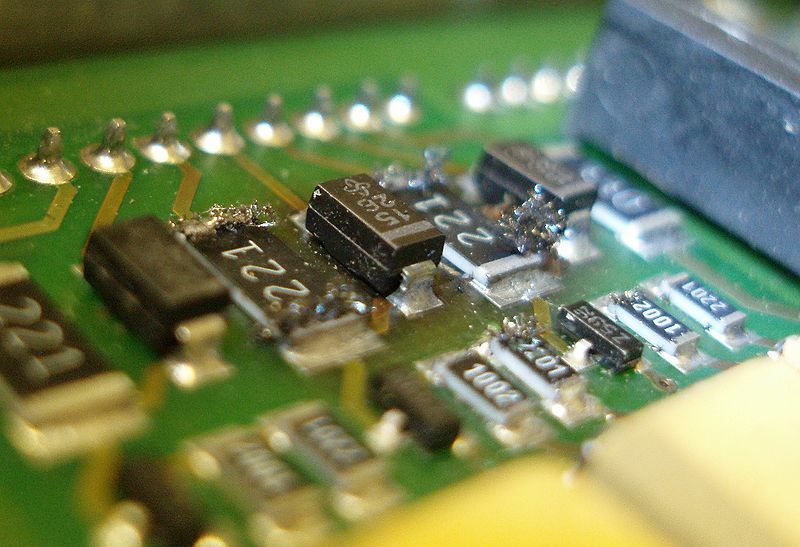 This type of failure is called dendritic growth, which is dendrites growing on circuit boards. This never happened with lead-tin soldered circuitry, but in the satellite it was caused by lead-free solder, made of an indium-tin alloy. You won't hear greenies talk about massive failures and other reliability problems related to the wide-spread use of lead-free solder. If you manufacture electronic equipment and want to ship product to the European Union, it must be certified lead-free and meet the RoHS standard or it won't be allowed into the country. Only exception to the RoHS regulation are electronic systems used for research only. Shipping cartons and documentation must be clearly labeled "For research use only" and can only used shipped to a non-consumer destination such as a university. By definition, the green movement's demands and actions show it functions exactly like a cult. But rhis movement is worse than a religious cult, since people in the western world don't have any option not to participate. With the green cult, rules and regulations are now forced upon everyone in the civilized world by invisible manipulators and social engineers. It can all be summed up with just one word: Brainwashing. Some greenies need to get a life and stop trying to live through fads, texting, facebook, chatting, cell phones and dumping guilt on people. They need to develop healthy, real, in-person human relationships. This is what all human beings need to thrive and it's built into our DNA. Or perhaps they simply need to fix the relationship they already have. Greenies should stop believing green brainwashing and be honest with themselves and know it isn't real. The green movement is the biggest lie ever promoted by industry to make billions of dollars and backed by all the world's governments.